In the years since the release of Restless Rubes (2008), Ninja Gun has gone on countless tours with the likes of Against Me!, Fake Problems and The Gaslight Anthem. Getting out of rural Georgia, must have been a heck of an experience for the band. It was also during these years that the economy was in tatters and when any hope for change has been more or less withered away. These were the harsh and troubling times that are largely reflected in Nina Gun’s new record, Roman Nose…. To begin the record, That’s Not What I Heard is a song that wears its politics on its sleeves and does not apologize for it. While the lyrics are built upon fiery slogans, they are nicely juxtaposed against a poppy and sugar-sweet score. The song calls out corporate bailouts and the evils of healthcare companies for doing harm against the average person. The band’s point is further illustrated with their first music video, which was animated by Shark Guts. For the next song, Hot Rain, the subject matter does not get any lighter. When I recently saw the band open for Against Me! at their last show at Common Grounds, Ninja Gun described the song’s subject to the audience. Hot Rain is about a generation young people raised to be farmers but are now unable to find work because changes in the job market and how they have been set adrift. With the end of the first side of the record, the overtly political and economic themes come to a close. With the second half of the record, the more emotional themes come to light. Lepers in Love is a song about a caustic relationship, one where both parties antagonize each other. The song swells and sways along with the roller coaster of emotions that are depicted and its leads nicely into the EP’s last track. 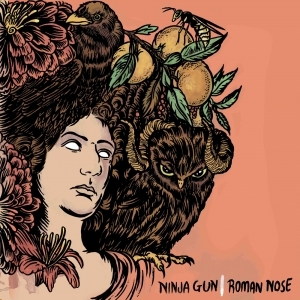 The title track, Roman Nose, fully realizes a maturation in Ninja Gun’s sound. The subject of this track is more abstract than its predecessors, but it is still just as striking. With this track, the listener can taste the years of fermenting bitterness, hatred, stress and depression, as they bubble throughout the entirety of the song. If the songs of Roman Nose were paintings hanging in an art gallery, they could all be described as melancholy reflections of politics, labor, love and life. All of these songs capture those elements in a grand and somber tone but it is the title track that would be masterpiece of that exhibit. It is the painful journeys that are sometimes the most valuable for a person to take. The cutting emotions that are expressed throughout Roman Nose‘s four songs are all very unforgiving and unrelenting in their honesty and together they form a great record. You would be doing yourself a disservice if you do not give Roman Nose a listen. This entry was posted on Tuesday, June 21st, 2011 at 6:00 pm	and tagged with Against Me!, common grounds, depression, fake problems, florida, gaslight anthems, Georgia, music, Ninja Gun, politics, punk, sabot productions, shark guts and posted in News, Reviews. You can follow any responses to this entry through the RSS 2.0 feed.